Since last night Tari called comments made by citizens about the Japan trip lies, I have no problem calling his statement lies. Just hit play below to hear him. First, he claims the Chief Legal Officer said he did nothing wrong. Who is the Chief Legal Officer Tari? Jeff Jurgens or somebody you don’t want to name? Margot didn’t attend a single meeting and isn’t mentioned in any of the minutes. She isn’t a member of the Committee. Delegate? Seriously? Remember the Renner post from Japan thanking Margot for being willing to pay her own way to join him? Does it sound like Renner considers her a delegate or a travel companion? Renner then goes on to explain how good people won’t run for office just to be trashed. Tari – you lied to me the very first time we met. Your minions trashed Kevin Lower – a truly good man. Liars deserve to be trashed. Leaders who tax their citizens to death because they want to spend and spend and spend deserve to be trashed. Citizens deserve Public Servants – people who think more about the taxpayers than their legacy. You aren’t even close to that description. My favorite is his claim the Sister Cities people were upset by FOIA requests. If people spending taxpayer money without posting agendas and minutes on their website (as required by the Open Meetings Act) are upset, they need to be trained properly. Finally, Tari claimed he was in Japan for 4 1/2 days. He claimed it takes 2 days to get there and two days to get back. I guess he didn’t notice gaining time and losing it going back in the opposite directions. According to a Pantagraph article he left on a Sunday. He was back very jet-lagged a week later on a Tuesday. That’s 10 days. Maybe you can get this one right – so how many days were you really gone Tari? Was 4 1/2 days just Sister Cities events and the rest a tour? Tari? Tari? IACE is the company that got paid almost $60,000 and labeled “tour”. Is that what you did the rest of time? Did the tour really cost more than $80,000 and how much did the participants pay – including Margot? My FOIA didn’t get a reimbursement from her on that part. I received the notice on Friday. Yesterday they couldn’t find it! 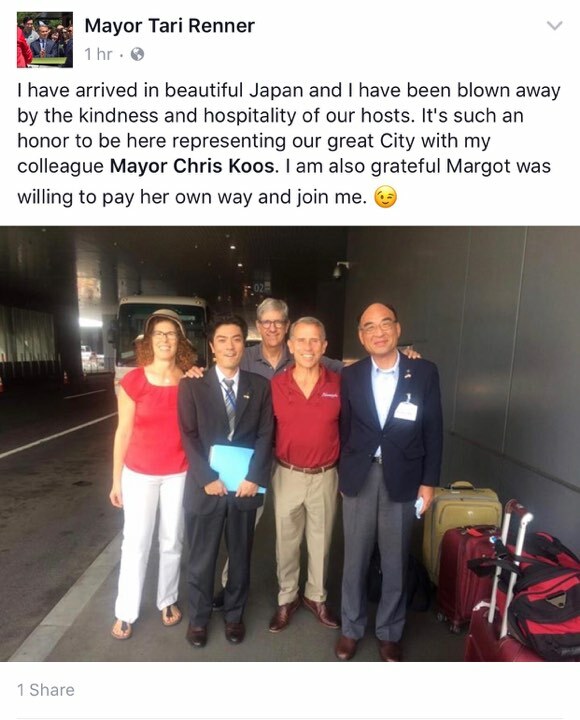 If the Council falls for Margot being an official delegate, they aren’t public servants either. Posted in - - - Please Contribute - - -, BloNo, Bloomington, elections, Hales, Local, Progressives, Renner, Taxes.Tagged BLOOMINGTON CITY COUNCIL, IACE, Japan, Sister Cities, Sister Cities Committee, Tari Renner. Accusing a citizen of speaking lies during public comment when the PCard policy was read out loud is appalling. Attacks just support the idea of misconduct. Renner or his assistant misused the card. He should admit that. The Council can decide what should be done as a result. ENOUGH is ENOUGH! Diane, from WHAT my friends tell me, you WERE a backer of Taris at FIRST, then as he Defecated on everyone, you took up a defensive stand-CONGRATULATIONS! Now Tari has taken it upon himself to attack most ANYONE who has a SHRED of DECENCY and the “Public be damned”! MY “council woman” won’t answer emails and from WHAT I see There NEEDS to be a LOT of things looked into! Care to respond Tari, as I’d REALLY like to hear WHAT you have to say in YOUR defense!!.. MAybe Nora can come up with something “cute’ for ya. And DOES she make $50K ? If NOT why not, as she seems to be your spokesperson. Mr Hales, must be packing for Topeka just about now, as I don’t hear HIM expounding on this! And I could go on! Give me a reason. Let’s talk about Springfield strippers!!! NEVER backed Tari! When he lied to me the 1st time we met, it was over! Great article Diane! I know I’m going to forward it to the ISP anode demand that they open a criminal investigation if they haven’t done so already. The additional unexplained cost is bothersome. What else is going to pop up on down the road about this trip? What else are they hiding? The public trust has been broken and law enforcement needs to investigate. Alderman need to step up to the plate and start holding this liar accountable or they will be held accountable. Enough is enough with this guy. Chambers is quoted in the Pantagraph as saying he won’t do anything about this. He says complainants should go to the police and file a report. Many more people need to contact ISP. Lt. Greg Cavanaugh he is at 815-844-1500 ext 2303. It needs to be made clear that the ACT of charging the airplane ticket on a government issued credit card is against the law, not the amount or whether or not it was paid back. The PCard Policy is a detailed itemization of Article VIII, Section 2 of the State Constitution. Management of PUBLIC funds are handled differently than PRIVATE funds, rightly so. That is certainly the point! Tari’s made-up excuse about Margot is only an attempt to keep from being in a lot of trouble. Diane’s readers should visit the WGLT site (ewwww, gross) and listen to their interview of Tari. He is absolutely off his rocker. How anyone can seriously support this guy is beyond explanation. Mike McCurdy worked on Renner’s campaign…the interviews a slanted…apparently, questions are submitted to Renner in advance…enough said. Renner is dead wrong when he says he did nothing wrong. It shows how far off his moral compass is. a person or entity (such as a vendor) doing business with an entity under the jurisdiction of the OEIG. Examples of allegations of violations by public employees that may be investigated by the OEIG include, but are not limited to: fraud, abuse of authority, corruption, theft of state property, improper use of state time, property, or other resources for prohibited political purposes, bid rigging, improper time reporting, and other forms of misuse of public property, equipment, or other assets. Complaints may be filed orally or preferably in writing. Forms for this purpose are available at the OEIG website, OEIG Complaint Forms. The media didn’t care enough to fact check. But that’s normal. Well, of course, whatever Tarry SAYS is enough for them. Next Post Preston investigated, but not Renner?